Here's To The Romantic Comedy Pleasures Of 'To All The Boys I've Loved Before' The Netflix adaptation of Jenny Han's YA romance is sparkly, sweet and very well-acted by its young leads. Well, it's safe to say Netflix giveth and Netflix taketh away. Only a week after the Grand Takething that was Insatiable, the streamer brings along To All The Boys I've Loved Before, a fizzy and endlessly charming adaptation of Jenny Han's YA romantic comedy novel. 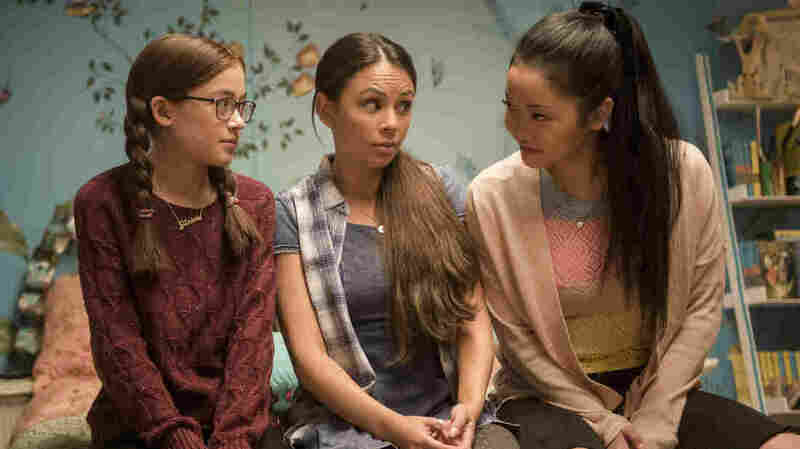 In the film, we meet Lara Jean Covey (Lana Condor), who's in high school and is the middle sister in a tight group of three: There's also Margot, who's about to go to college abroad, and Kitty, a precocious (but not too precocious) tween. Unlike so many teen-girl protagonists who war with their sisters or don't understand them or barely tolerate them until the closing moments where a bond emerges, Lara Jean considers her sisters to be her closest confidantes — her closest allies. They live with their dad (John Corbett); their mom, who was Korean, died years ago, when Kitty was very little. Lara Jean has long pined for the boy next door, Josh (Israel Broussard), who is Margot's boyfriend, and ... you know what? This is where it becomes a very well-done execution of romantic comedy tricks, and there's no point in giving away the whole game. Suffice it to say that a small box of love letters Lara Jean has written to boys she had crushes on manages to make it out into the world — not just her letter to Josh, but her letter to her ex-best-friend's boyfriend Peter (Noah Centineo), her letter to a boy she knew at model U.N., her letter to a boy from camp, and her letter to a boy who was kind to her at a dance once. This kind of mishap only happens in romantic comedies (including those written by Shakespeare), as do stories where people pretend to date — which, spoiler alert, also happens in Lara Jean's journey. But there's a reason those things endure, and that's because when they're done well, they're as appealing as a solid murder mystery or a rousing action movie. So much of the well-tempered rom-com comes down to casting, and Condor is a very, very good lead. She has just the right balance of surety and caution to play a girl who doesn't suffer from traditionally defined insecurity as much as a guarded tendency to keep her feelings to herself — except when she writes them down. She carries Han's portrayal of Lara Jean as funny and intelligent, both independent and attached to her family. In a way, Centineo — who emerges as the male lead — has a harder job, because Peter isn't as inherently interesting as Lara Jean. Ultimately, he is The Boy, in the way so many films have The Girl, and it is not his story. But he is what The Boy in these stories must always be: He is transfixed by her, transparently, in just the right way. There is something so wonderful about the able, loving, unapologetic crafting of a finely tuned genre piece. Perhaps a culinary metaphor will help: Consider the fact that you may have had many chocolate cakes in your life, most made with ingredients that include flour and sugar and butter and eggs, cocoa and vanilla and so forth. They all taste like chocolate cake. Most are not daring; the ones that are often seem like they're missing the point. But they deliver — some better than others, but all with similar aims — on the pleasures and the comforts and the pattern recognition in your brain that says "this is a chocolate cake, and that's something I like." When crafting a romantic comedy, as when crafting a chocolate cake, the point is to respect and lovingly follow a tradition while bringing your own touches and your own interpretations to bear. Han's characters — via the Sofia Alvarez screenplay and Susan Johnson's direction — flesh out a rom-com that's sparkly and light as a feather, even as it brings along plenty of heart. And yes, this is an Asian-American story by an Asian-American writer. It's emphatically true, and not reinforced often enough, that not every romantic comedy needs white characters and white actors. Anyone would be lucky to find a relatable figure in Lara Jean; it's even nicer that her family doesn't look like most of the ones on American English-language TV. The film is precisely what it should be: pleasing and clever, comforting and fun and romantic. Just right for your Friday night, your Saturday afternoon, and many lazy layabout days to come.